اعتماد, احمد, رحمت اللهی, حسین. (1396). الگوی حقوقی تعادل بین خودمختاری مناطق و یکپارچگی ملت در اندیشه دادگاه قانون اساسی اسپانیا (مطالعه موردی: استقلال‌طلبی کاتالان). پژوهش های روابط بین الملل, 7(26), 123-156. احمد اعتماد; حسین رحمت اللهی. "الگوی حقوقی تعادل بین خودمختاری مناطق و یکپارچگی ملت در اندیشه دادگاه قانون اساسی اسپانیا (مطالعه موردی: استقلال‌طلبی کاتالان)". پژوهش های روابط بین الملل, 7, 26, 1396, 123-156. اعتماد, احمد, رحمت اللهی, حسین. (1396). 'الگوی حقوقی تعادل بین خودمختاری مناطق و یکپارچگی ملت در اندیشه دادگاه قانون اساسی اسپانیا (مطالعه موردی: استقلال‌طلبی کاتالان)', پژوهش های روابط بین الملل, 7(26), pp. 123-156. اعتماد, احمد, رحمت اللهی, حسین. الگوی حقوقی تعادل بین خودمختاری مناطق و یکپارچگی ملت در اندیشه دادگاه قانون اساسی اسپانیا (مطالعه موردی: استقلال‌طلبی کاتالان). پژوهش های روابط بین الملل, 1396; 7(26): 123-156. 1دانشجوی دکتری حقوق عمومی، پردیس بین المللی کیش، دانشگاه تهران ، تهران، ایران. 2دانشیار پردیس فارابی دانشگاه تهران،گروه حقوق عمومی، تهران، ایران (نویسنده مسوول:hrahmat3667@yahoo.com ). نظام حقوقی اسپانیا که به دلیل وجود تفاوت­های قومی، فرهنگی، زبانی و مذهبی ازیک سیستم باز عدم تمرکز و در قالب نظام منطقه­ای با اعطای خودمختاری به مناطق مختلف هفده گانه اداره می­شود، می­توان یک دولت بسیط محسوب کرد که تمرکززدایی آن هم سطح دولت­های مرکب نیست. 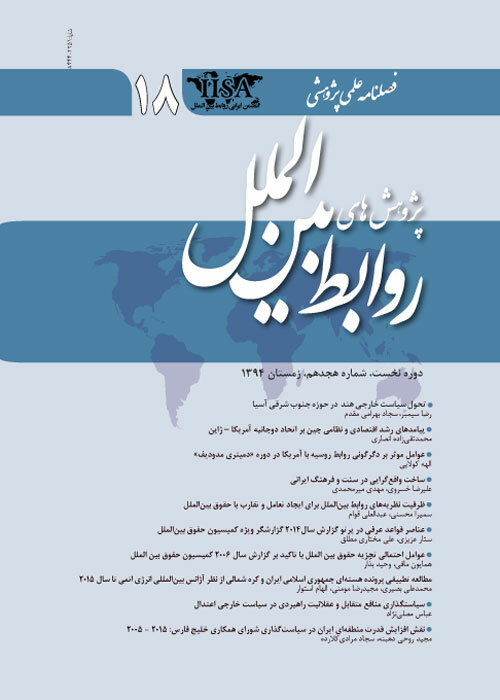 در مقابل صیانت ازتمرکززدایی منطقه­ای و آزادی واحدهای محلی، قانون اساسی اسپانیا محدودیت تجزیه‌ناپذیری ملت اسپانیا را به مانند چراغ قرمز از نظر دور نداشته است. برای تضمین و صیانت از این اصول نقش نهادهای دولت مرکزی ازجمله دادگاه قانون اساسی اسپانیا از همة نهادها در برهه­های زمانی مختلف، مخصوصا در سال­های اخیرکه احساسات استقلال‌طلبانه در کاتالونیا به اوج خود رسیده پررنگ‌تر و آشکار است. باتوجه به مناقشات حادث شده بین دولت مرکزی و نهادهای منطقه خودمختارکاتالان، عملا دادگاه خود را در مواجهه با دو اصل مهم می‌بیند؛ یکی اصل مشروطه‌خواهی که بر حفظ حاکمیت قانون اساسی و اصول مهم آن از جمله؛ یکپارچگی ملت تأکید دارد و دیگری حق تعیین سرنوشت، که برخلاف مفهوم حقوقی آن که بیانگر آزادی عمل و استقلال اداری مناطق خودمختار است، در مفهوم سیاسی به سمت تجزیه‌طلبی گرایش پیداکرده است. نفوذ دادگاه بر نظم سیاسی در وهله نخست از ایفای نقش داوری بین دولت مرکزی و واحدهای مستقل محلی برمی­خیزد و دادرس اساسی تلاش می­کند تنش‌ها را کاهش داده و تعادل لازم بین خودمختاری مناطق ویکپارچگی ملت به وجود آورده، به نحوی که هم ضامن یکپارچگی وحاکمیت مستقل ملت اسپانیا باشد و هم ازخودمختاری مناطق، صیانت اساسی کند. The Spanish legal system, which is administered due to ethnic, cultural, linguistic, and religious differences with open decentralization system and in the form of a regional system giving autonomy to different 17th regions, can be considered as a large state whose decentralization does not have the same level of compound states. In opposite direction of maintenance regional decentralization, and freedom of local units, Spanish constitution did not disassociate the limitation of Spanish indivisibility as a red light. To guarantee and safeguard these principles, the role of central government institutions including Spanish Constitutional Court is more evident from all institutions at different times, especially in recent years when feeling of independency has reached its peak. Given the disputes occurred between central government and institutions of Catalan autonomous region, court essentially faces two important principles. One of these principles is constitutionalism that emphasizes the maintenance of constitutional sovereignty and its important principles including indivisibility of nation, and the other is self-determination right, contrary to its legal concept which expresses freedom of action and administrative of autonomous regions, has shown tendency toward secession in political concept. In the first place, the influence of court on political order arises from the role played by arbitration or judgment between central government and local autonomous units, and constitutional judgeattempts to reduce tensions and create necessary balance between autonomy of regions and integration of nation in such a way as to safeguard indivisibility and sovereignty of Spanish people and protect autonomy of regions. بشیریه، حسین. (1387). درس‌های دموکراسی برای همه. چاپ سوم. تهران: نشرنگاه معاصر. رحمت‌اللهی، حسین و احسان آقامحمداقایی. (1395). گذار از دولت مطلقه به دولت مشروطه. تهران: انتشارات خرسندی. عباسی، بیژن. (1390). حقوق بشر و آزادی‌های بنیادین. تهران: نشردادگستر. فاورو، لویی. (1388). دادگاه‌های قانون اساسی: الگوی اروپایی دادرسی اساسی. ترجمه علی‌اکبر گرجی ازندریانی. تهران: انتشارات میزان. ویرولی، مائوریتسیو. (1394). جمهوری‌خواهی. ترجمه حسن افشار. تهران: نشر مرکز. ویژه، محمدرضا. (1394). کلیات حقوق اساسی.چاپ دوم. تهران: انتشارات سمت. Acienro, S and J. Baquero Cruz. (2005). The Order of the Spanish Constitutional Court on the proposal to convert the Basque Country into a freely associated community: Keeping hands off constitutional politics. International journal of constitutional law, 3(4), pp. 687-695. Angel, M. M. (2012). Local government in the member states of the European Union: a comparative legal perspective. Madrid: National institute of public administration, Spain. Barclo, M.(2014).The right to decide in Catalonia and Spain-its place in the constitution and legal basis. Diploca, 7(1), pp.1-4. Bartlett Castella, E. R. (2014). Scotland and Catalonia: Two historic nations challenge a three hundred year-old status Quo. American international journal of social science, 3 (4), pp. 63-75. Bayona Rocamora, A. (2017). The political future of Catalonia: the role of parliament. Revista Catalane de Deret public, 54, pp.1-23. Crameri, K. (2015).Do Catalans have the right to decide? Secession legitimacy and democracy in twenty-first century Europe. Golobal Discourse. Daly. E. (2015).The indivisibility of the French republic as political theory and constitutional doctorine. European constitutional law Review, 11 (03), pp.458-481. Devisser, M. (2015). Constitutional review in Europe: A Comparative Analysis. oxford and Portland ,Oregon. Ferreres, V. C. (2013). The Constitution of Spain. United Kingdom: hart publishing. Gonzalez, M. G. (2015). Catalonia's independence and the role of the constitutional court: recent developments. BIJ DE BUREN JUNUARI, pp. 86-94. Himsworth, C. M. G. (2015). The European Charter of Local Self-Government A treaty for local democracy. Edinburgh University Press. Jackiewicz, A. (2012).The principle of unitarism, subsidiarity and decentralization as a constitutional basis of regional self-government of the republic of Poland. Studies in logic, grammar and rhetoric, 31 (44), pp. 175-189. Minder, R. (2012).Spain's Leader Fails to Reach Deal With Catalonia. N.Y.Times, sept 20. Moreno, L. (1997). Federalisation and Ethnoterritorial Concurrence in Spain. The Journal of Federalism, 27 (4). Plank, M. (2011). Referendum. Oxford: Oxford public International law. Ragone, S. CATALONIA'S RECENT STRIVE FOR INDEPENDENCE: A LEGAL APPROACH, Available at: www.bgazrt.hu/-dbfiles. Yaniv, R and S. Suteu. (2015).Eternal Territory? The Crimean Crisis and Ukrain Territorial Integrity as an unamendable principle. research paper series University of Edinburg, 15, pp.1-27.